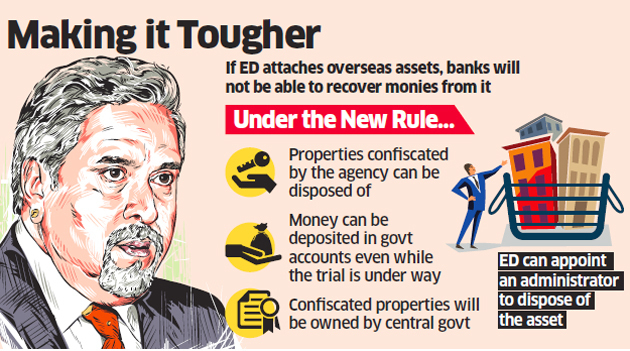 The Enforcement Directorate (ED) may use the latest weapon in its armoury — the Fugitive Economic Offenders Ordinance — to deal with Vijay Mallya, a move that could hurt lenders’ efforts to recover dues from the businessman who fled the country more than two years ago. ED sources said the new fugitive law gives precedence to state dues over any claims under civil cases, including Mallya’s application to the Karnataka High Court seeking permission to repay banks by selling his assets seized by the agency that probes money-laundering cases. Indian banks are working closely with UK authorities to recover the maximum out of the assets owned by Mallya, after a British court allowed them to search and seize his properties. They are worried because the ED could stake claim on Mallya’s overseas assets, delaying their efforts to recover the arrears. On July 5, a UK court ruled in favour of Indian banks by permitting enforcement officers to enter properties of Mallya and possess the goods. This latest order followed a UK High Court ruling in May, which refused to overturn a worldwide order freezing Mallya’s assets and upheld an Indian court’s ruling that the Indian banks were entitled to recover funds. This provision makes the latest law far more stringent than the Prevention of Money Laundering Act (PMLA), which provides for attachment of the property of the accused who stays the owner of the assets. Mallya did not respond to an emailed questionnaire. The businessman in a public letter on June 26 said he and United Breweries Holdings had filed an application before the Karnataka High Court on June 22, listing assets worth Rs 13,900 crore. He sought the court’s permission to allow the sale of these assets under judicial supervision to repay creditors, including state-owned banks. The special PMLA court has summoned Mallya and others on August 27, taking cognisance of ED’s plea under the new law to bring him back to India. As per the ED application, Mallya owed banks around `9,990 crore as of May 2018. ED officials also claimed that Mallya has tried to circumvent the CBI and ED by filing an application before the Karnataka HC. But the latest ordinance gives the two agencies the discretionary powers to challenge it and recover the dues as soon as possible. If Mallya does not appear before the court on the stipulated date, he will be declared a fugitive and his assets will be disposed of, people in the know said. “It is ludicrous to say the ED or CBI is stopping anybody from selling assets… Mallya has been charged under the provisions of the Anti-Money Laundering Act, which gives the entire matter a criminal flavour,” a lawyer involved with the case said. “So, automatically, the law gives the ED and CBI the powers to bring him to book.” Under the new fugitive law, the confiscated properties will be owned by the central government, which will appoint an administrator to dispose of the assets. “No case related to these confiscations will be entertained by any court or tribunal anywhere, as per the ordinance, once the PMLA court declares an accused a fugitive economic offender,” an ED official said. But some bankers hope the new law will not affect the proceedings that they have initiated abroad. “The UK verdict was on the basis on a petition filed by a consortium of 13 banks. So, whatever recovery happens will come to banks first. Attachment of Mallya’s overseas assets can only be done through the UK court and the order is in favour of the banks,” a banking official close to the matter said. In his first public statement in almost two years, Mallya complained that he was the victim of a politically motivated witch-hunt, made the scapegoat for corporate defaults and wrongfully accused of violations by the CBI and ED. “I have become the ‘poster boy’ of bank default and a lightning rod of public anger,” he said. The ED sources who spoke to ET dismissed the claims of a targeted chase and said Mallya was one of the biggest bank defaulters to first flee the country. “He chose to flee the country so these are proceedings against him in the order of cases… we will be going after (Punjab National Bank scam accused) Nirav Modi or Mehul Choksi in a similar manner,” the official said, speaking on the condition of anonymity.